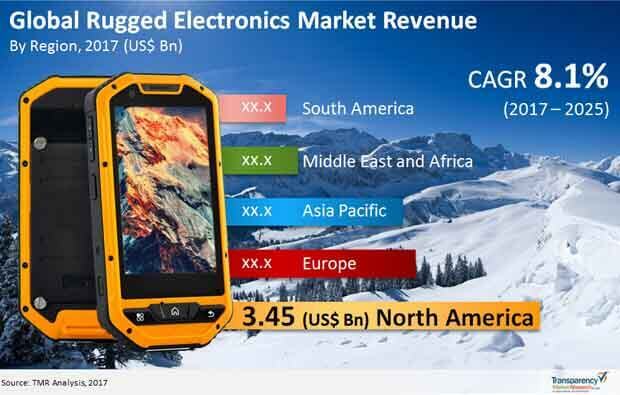 According to a fresh business intelligence study by Transparency Market Research (TMR), the global market for rugged electronics is characterized by a presence of a large number of key players that renders intense competition among them. Due to the rising applications of rugged electronics, key players in the market are vying to introduce novel products, thus intensifying competition amongst them. Prominent names in the global rugged electronics market include Siemens AG, Artesyn Embedded Technologies, Mountain Secure Systems, Crystal Group Inc., General Dynamics Corporation, Kontron AG, NCS Technologies Inc., Schneider Electric SE, Trenton Systems Inc., XES Inc., Systel Inc., Comark Corporation, Core Systems, Curtiss Wright Controls Electronic Systems Inc., General Micro Systems, Leonardo DRS, Rave Computer, Schweitzer Engineering Laboratories, Westek Technology Ltd., and ZMicro Inc. According to the TMR report, the global rugged electronics market is likely to clock a solid 8.1% CAGR over the 2017-2025 forecast timeframe. Rising at this rate, the market’s valuation of US$9.4 bn in 2017 will become US$17.46 bn by 2025. Product-wise, the industrial computing and handheld devices segment is anticipated to emerge significant in the overall market due to their increasing adoption in a host of industries such as power, transportation, defense, and adventure sports. The defense end-user segment is likely to display the leading growth rate and hold the leading market share over the report’s forecast period. Powered by the U.S, North America is likely to contribute significant revenue to the rugged electronics market in the upcoming years. One of the key growth drivers of the rugged electronics market is the rising applications of rugged electronics in the defense sector. Modern warfare capabilities considerably bank on communication devices that are monitored by computer systems deployed at a central control unit and use of modern electronics in various combat systems. The steady demand for rugged electronics from the defense sector has been a boon to the rugged electronics market. This is to provide reliable equipment that can function optimally even at battleground. Several nations worldwide are expanding their defense budgets to enhance warfare capabilities with smart combat systems rather than bulky and voluminous war weaponry. The power industry is also a playing a pivotal role in the development of the rugged electronics market. The rising demand for smart grids to minimize energy loss and for maximum efficiency of distribution has led to investment in the power sector. This is leading to the adoption of hi-tech equipment such as rugged electronics that can sustain ambient fluctuations. As the power sector is heading to become almost completely free of human supervision, the use of rugged electronics could become a key element of the transformation. Despite the rising demand for rugged electronics across a number of industry verticals, the development of rugged electronics to serve individual electronics customers is yet to happen. This is one of the most crucial consumer demographics for demand for electronics in modern times. While the usefulness of rugged electronics remains undoubted, it does not extend notable benefits to the average urban consumer. Thus, the high cost of underlying technology needs to be equalized with high volume order to help the growth of rugged electronics sector. While some features of rugged electronics are likely to become part of regular consumer electronics, its limited adoption in consumer electronics could dampen the growth of rugged electronics industry. Rugged electronics to play a key role for the power sector to become free of human supervision in the future.